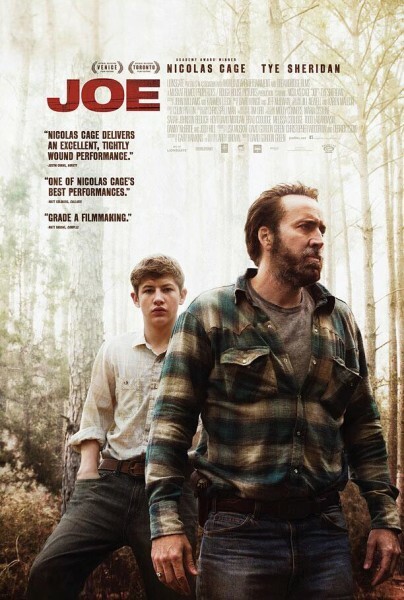 “Joe” is quite simply Nicolas Cage’s best movie in years. It’s a reminder of what a good actor he can be and that’s something we haven’t seen onscreen in a very long time. Director David Gordon Green returns to his indie roots after a series of Hollywood disappointments (“Your Highness”, “The Sitter”) with an intriguing fable that recalls last year’s underrated “Mud”. His film takes place in a small community, where an ex-con (Cage) supervises a group of hard-working men who spend all day replacing sick trees with healthier variety. One day, he meets a young boy called Gary (a terrific Tye Sheridan) who asks to join his crew. We also meet his daddy, who enjoys beating the crap out of him. As Joe learns more about this kid, he decides to take him under his wing. If you’ve seen “Mud”, then you should know that “Joe” unfolds at a deliberate pace, which suits this mode of storytelling. We come to feel as we know all the characters who populate the story, including the working men and the townies. This is the kind of film where tiny details and vignettes convey more than long speeches possibly could. The cast couldn’t be better, with Nicolas Cage on top of his game after years of disappointments. I realize that a movie like “Joe” may not be every moviegoer’s cup of tea, but I fell under its spell almost instantly and I hope it finds the audience it deserves. Interesting take. We ended up turning off the movie.Maybe we should of stuck it out!